Grant McCann says he's passionate about Peterborough United. Grant McCann insists that tough challenges will make him a better managaer. 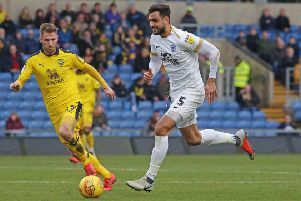 The Posh boss has come in for some criticism of late after poor performances at Rochdale and Woking but today (December 5) he hit back. “If some people have a different agenda then that’s up to them. But I can assure you that I’m passionate about this club - always have been - and will be doing all I can to make sure we’re up there challenging at the end of the season,” said McCann. “Nobody is going to tear us apart. The characters I have in the group and the staff I have got around me will make sure the only way we go is up. “I proved as a player that challenges make me better and I’ll do the same as a manager. Those games are a Checkatrade Trophy match with Southend tomorrow, a League One clash with Blackburn Rovers on Saturday and an FA Cup replay with Woking next Tuesday. “It’s an important time for us and I know we can improve. We are still in amongst them and we will become stronger in the second half of the season,” he added. And the manager said the Checkatrade Trophy was important to the club. McCann gave away no real clues as to what sort of side he’ll be putting out tomorrow. “Southend is a tough game and I will pick a side to win it,” he said. “Everybody is fit. The games are coming thick and fast but we recover well from games. And let’s face it,the players prefer playing games to training.